I’ve always been in love with Audis. A 90s model Audi A4 is slightly within my financial capabilities these days, but I am a bit put off by the fear of high maintenance. At first glance you might think this is an Audi A8. But the red and platinum badge on the grille gives that away. This is Audi’s BMW M5 killer, the Audi S8. The Audi S8 is a tuned up sporty model of it’s flagship A8 luxury car. First of all, the engine. To put it into the same league as the BMW M5, the new Audi S8 has been equipped with an engine similiar to the Lamborghini Gallardo’s 5.0 litre V10 engine that makes 450bhp of power and 540Nm of torque. This is comparable to the BMW M5’s V10 which makes 400hp in normal mode and 507hp in M-mode. This lightweight engine weighs only 220kg, about 20kg less than equivalent competitors. The Audi S8 itself is only 1940kg in total weight. While the power to weight ratio is not as astounding as the Ariel Atom 2, it’s still good. The engine uses FSI direct petrol injection, with allows a high compression ratio of 12.5:1. The injection system uses common rail injection, and injects petrol in precise amounts at pressures up to 100 bar. Direct injection also allows the air-fuel ratio to be finetuned to the leanest possible, for maximum power. This powerful engine is mated to a six-speed tiptronic transmission. Power is transferred to all four wheels with Quattro all-wheel drive, with a default torque bias of 40:60 to the front and back wheels respectively. Maximum torque bias for the front is 65%, and the back is 85%. 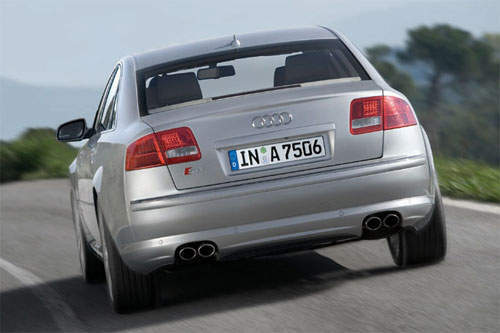 The car rides on an adaptive air suspension which comes as an option for the Audi A8, but standard for the Audi S8. Ride height and other suspension characteristics can be adjusted either automatically or through 3 other preset driving modes – comfort, dynamic or lift. Ground clearange ranges from 95mm to 125mm. The Audi S8 is equipped with 18 inch ceramic disc brake that are less prone to brake fade and also are half the weight of ordinary steel brake discs. These discs hide inside 20 inch sports rims wrapped with 265/35/R20 tyres. 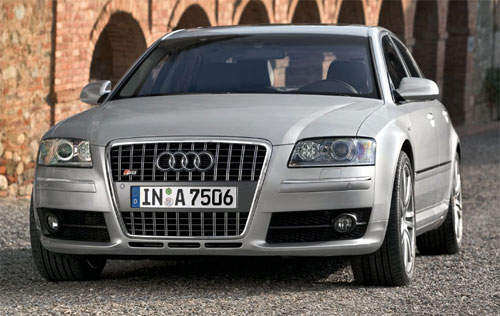 The Audi S8 is set to be launched in mid-2006.